The heart is the life-giving, ever-beating muscle in your chest. From inside the womb until death, the thump goes on. The heart for the average human will contract about 3 billion times; never resting, never stopping to take a break except for a fraction of a second between beats. At 80 years of age, a person's heart will continue to beat an average of 100,000 times a day. Many believe that the heart is the first organ to become functional. Within weeks of conception the heart starts its mission of supplying the body with nutrients even though the embryo is no bigger than a capital letter on this page. The primary function of the heart is to pump blood through the arteries, capillaries, and veins. There are an estimated 60,000 miles of vessels throughout an adult body. Blood transports oxygen, nutrients, disease causing viruses, bacteria, hormones and has other important functions as well. The heart is the pump that keeps blood circulating properly. Americans today have many options to take care of their heart and circulatory system. Expanding medical technology has made it much easier to do so. This chapter is dedicated to the heart and its many parts. The heart is a hollow, muscular organ about the size of a fist. It is responsible for pumping blood through the blood vessels by repeated, rhythmic contractions. The heart is composed of cardiac muscle, an involuntary muscle tissue that is found only within this organ. The term "cardiac" (as in cardiology) means "related to the heart” and comes from the Greek word kardia, for "heart." It has a four-chambered, double pump and is located in the thoracic cavity between the lungs. The cardiac muscle is self-exciting, meaning it has its own conduction system. This is in contrast with skeletal muscle, which requires either conscious or reflex nervous stimuli. The heart's rhythmic contractions occur spontaneously, although the frequency or heart rate can be changed by nervous or hormonal influence such as exercise or the perception of danger. The endocardium is the innermost lining of the heart which consists of the endothelial cells forming a smooth membrane in places, and a pocked and tribeculated surface in others (mainly the ventricles, or lower pumping chambers). The myocardium is the muscular tissue of the heart. The myocardium is composed of specialized cardiac muscle cells with an ability not possessed by muscle tissue elsewhere in the body. Cardiac muscle, like other muscles, can contract, but it can also conduct electricity, like nerves. The blood to the myocardium is supplied by the coronary arteries. If these arteries are occluded by atherosclerosis and/or thrombosis, this can lead to angina pectoris or myocardial infarction due to ischemia (lack of oxygen). Failure of the heart to contract properly (for various reasons) is termed heart failure, generally leading to fluid retention, edema, pulmonary edema, renal insufficiency, hepatomegaly, a shortened life expectancy and decreased quality of life. The outer most layer next to the myocardium is known as the Epicardium. This is the outer layer after endocardium and myocardium that consists of a thin layer of connective tissue and fat. The pericardium is the thick, membranous sac that surrounds the heart. It protects and lubricates the heart. There are two layers to the pericardium: the fibrous pericardium and the serous pericardium. The serous pericardium is divided into two layers; in between these two layers there is a space called the pericardial cavity. 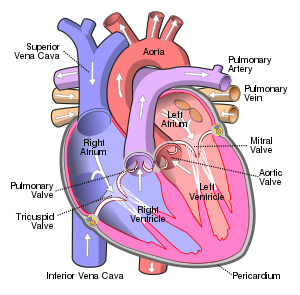 The heart has four chambers, two atria and two ventricles. The atria are smaller with thin walls, while the ventricles are larger and much stronger. There are two atria on either side of the heart. On the right side is the atrium that contains blood which is poor in oxygen. The left atrium contains blood which has been oxygenated and is ready to be sent to the body. The right atrium receives de-oxygenated blood from the superior vena cava and inferior vena cava. The left atrium receives oxygenated blood from the left and right pulmonary veins. Atria facilitate circulation primarily by allowing uninterrupted venous flow to the heart, preventing the inertia of interrupted venous flow that would otherwise occur at each ventricular systole. The ventricle is a heart chamber which collects blood from an atrium and pumps it out of the heart. There are two ventricles: the right ventricle pumps blood into the pulmonary artery which takes the blood through the pulmonary circuit, and the left ventricle pumps blood into the aorta for systemic circulation to the rest of the body. Ventricles have thicker walls than the atria, and thus can create the higher blood pressure. Comparing the left and right ventricle, the left ventricle has thicker walls because it needs to pump blood to the whole body. This leads to the common misconception that the heart lies on the left side of the body. The inter ventricular septum (ventricular septum, or during development septum inferius) is the thick wall separating the lower chambers (the ventricles) of the heart from one another. The ventricular septum is directed backward and to the right, and is curved toward the right ventricle. The greater portion of it is thick and muscular and constitutes the muscular ventricular septum. Its upper and posterior part, which separates the aortic vestibule from the lower part of the right atrium and upper part of the right ventricle, is thin and fibrous, and is termed the membranous ventricular septum. The two atrioventricular (AV) valves are one-way valves that ensure that blood flows from the atria to the ventricles, and not the other way. The two semilunar (SL) valves are present in the arteries leaving the heart; they prevent blood from flowing back into the ventricles. The sound heard in a heart beat is the heart valves shutting. The right AV valve is also called the tricuspid valve because it has three flaps. It is located between the right atrium and the right ventricle. The tricuspid valve allows blood to flow from the right atrium into the right ventricle when the heart is relaxed during diastole. When the heart begins to contract, the heart enters a phase called systole, and the atrium pushes blood into the ventricle. Then, the ventricle begins to contract and blood pressure inside the heart rises. When the ventricular pressure exceeds the pressure in the atrium, the tricuspid valve snaps shut. The left AV valve is also called the bicuspid valve because it has two flaps. It is also known as the mitral valve due to the resemblance to a bishop's mitre (liturgical headdress). This valve prevents blood in the left ventricle from flowing into the left atrium. As it is on the left side of the heart, it must withstand a great deal of strain and pressure; this is why it is made of only two cusps, as a simpler mechanism entails a reduced risk of malfunction. There are two remaining valves called the Semilunar Valves. They have flaps that resemble half moons. The pulmonary semilunar valve lies between the right ventricle and the pulmonary trunk. The aortic semilunar valve is located between the ventricle and the aorta. The chordae tendinae are attached to papillary muscles that cause tension to better hold the valve. Together, the papillary muscles and the chordae tendinae are known as the subvalvular apparatus. The function of the subvalvular apparatus is to keep the valves from prolapsing into the atria when they close. The subvalvular apparatus have no effect on the opening and closing of the valves. This is caused entirely by the pressure gradient across the valve. The most common congenital abnormality of the heart is the bicuspid aortic valve. In this condition, instead of three cusps, the aortic valve has two cusps. This condition is often undiagnosed until the person develops calcific aortic stenosis. Aortic stenosis occurs in this condition usually in patients in their 40s or 50s, an average of 10 years earlier than in people with normal aortic valves. Another common complication of rheumatic fever is thickening and stenosis (partial blocking) of the mitral valve. For patients who have had rheumatic fever dentists are advised to prophylactically administer antibiotics prior to dental work to prevent bacterial endocarditis that occurs when bacteria from the teeth enter the circulation and attach to damaged heart valves. The aortic valve is a semilunar valve, but it´s called bicuspid because of it´s regular three "cusps" or "semilunar" valves, and is not to be confused with the left atrioventricular valve, which is more commonly called the mitral valve, and is one of the two cuspidal valves. While it is convenient to describe the flow of the blood through the right side of the heart and then through the left side, it is important to realize that both atria contract at the same time and that both ventricles contract at the same time. The heart works as two pumps, one on the right and one on the left that works simultaneously. The right pump pumps the blood to the lungs or the pulmonary circulation at the same time that the left pump pumps blood to the rest of the body or the systemic circulation. Venous blood from systemic circulation (deoxygenated) enters the right atrium through the superior and inferior vena cava. The right atrium contracts and forces the blood through the tricuspid valve (right atrioventricular valve) and into the right ventricles. The right ventricles contract and force the blood through the pulmonary semilunar valve into the pulmonary trunk and out the pulmonary artery. This takes the blood to the lungs where the blood releases carbon dioxide and receives a new supply of oxygen. The new blood is carried in the pulmonary veins that take it to the left atrium. The left atrium then contracts and forces blood through the left atrioventricular, bicuspid, or mitral, valve into the left ventricle. The left ventricle contracts forcing blood through the aortic semilunar valve into the ascending aorta. It then branches to arteries carrying oxygen rich blood to all parts of the body. From the arterioles, the blood then enters one or more capillaries. The walls of capillaries are so thin and fragile that blood cells can only pass in single file. Inside the capillaries, exchange of oxygen and carbon dioxide takes place. Red blood cells inside the capillary releases their oxygen which passes through the wall and into the surrounding tissue. The tissue then releases waste, such as carbon dioxide, which then passes through the wall and into the red blood cells. The circulatory system is extremely important in sustaining life. It’s proper functioning is responsible for the delivery of oxygen and nutrients to all cells, as well as the removal of carbon dioxide, waste products, maintenance of optimum pH, and the mobility of the elements, proteins and cells, of the immune system. In developed countries, the two leading causes of death, myocardial infarction and stroke are each direct results of an arterial system that has been slowly and progressively compromised by years of deterioration. Arteries are muscular blood vessels that carry blood away from the heart, oxygenated and deoxygenated blood . The pulmonary arteries will carry deoxygenated blood to the lungs and the sytemic arteries will carry oxygenated blood to the rest of the body. Arteries have a thick wall that consists of three layers. The inside layer is called the endothelium, the middle layer is mostly smooth muscle and the outside layer is connective tissue. The artery walls are thick so that when blood enters under pressure the walls can expand. An arteriole is a small artery that extends and leads to capillaries. Arterioles have thick smooth muscular walls. These smooth muscles are able to contract (causing vessel constriction) and relax (causing vessel dilation). This contracting and relaxing affects blood pressure; the higher number of vessels dilated, the lower blood pressure will be. Arterioles are just visible to the naked eye. Capillaries are the smallest of a body’s vessels; they connect arteries and veins, and most closely interact with tissues. They are very prevalent in the body; total surface area is about 6,300 square meters. Because of this, no cell is very far from a capillary, no more than 50 micrometers away. The walls of capillaries are composed of a single layer of cells, the endothelium, which is the inner lining of all the vessels. This layer is so thin that molecules such as oxygen, water and lipids can pass through them by diffusion and enter the tissues. Waste products such as carbon dioxide and urea can diffuse back into the blood to be carried away for removal from the body. The "capillary bed" is the network of capillaries present throughout the body. These beds are able to be “opened” and “closed” at any given time, according to need. This process is called autoregulation and capillary beds usually carry no more than 25% of the amount of blood it could hold at any time. The more metabolically active the cells, the more capillaries it will require to supply nutrients. Veins carry blood to the heart. The pulmonary veins will carry oxygenated blood to the heart awhile the systemic veins will carry deoxygenated to the heart. Most of the blood volume is found in the venous system; about 70% at any given time. The veins outer walls have the same three layers as the arteries, differing only because there is a lack of smooth muscle in the inner layer and less connective tissue on the outer layer. Veins have low blood pressure compared to arteries and need the help of skeletal muscles to bring blood back to the heart. Most veins have one-way valves called venous valves to prevent backflow caused by gravity. They also have a thick collagen outer layer, which helps maintain blood pressure and stop blood pooling. If a person is standing still for long periods or is bedridden, blood can accumulate in veins and can cause varicose veins. The hollow internal cavity in which the blood flows is called the lumen. A muscular layer allows veins to contract, which puts more blood into circulation. Veins are used medically as points of access to the blood stream, permitting the withdrawal of blood specimens (venipuncture) for testing purposes, and enabling the infusion of fluid, electrolytes, nutrition, and medications (intravenous delivery). A venule is a small vein that allows deoxygenated blood to return from the capillary beds to the larger blood veins, except in the pulmonary circuit were the blood is oxygenated. Venules have three layers; they have the same makeup as arteries with less smooth muscle, making them thinner. Human circulatory system. Arteries are shown in red, veins blue. The double circulatory system of blood flow refers to the separate systems of pulmonary circulation and the systemic circulation in amphibians, birds and mammals (including humans.) In contrast, fishes have a single circulation system. 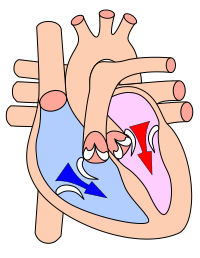 For instance, the adult human heart consists of two separated pumps, the right side with the right atrium and ventricle (which pumps deoxygenated blood into the pulmonary circulation), and the left side with the left atrium and ventricle (which pumps oxygenated blood into the systemic circulation). Blood in one circuit has to go through the heart to enter the other circuit. Blood circulates through the body two to three times every minute. In one day, the blood travels a total of 19,000 km (12,000 miles), or four times the distance across the U.S. from coast to coast. In the pulmonary circuit, blood is pumped to the lungs from the right ventricle of the heart. It is carried to the lungs via pulmonary arteries. At lungs, oxygen in the alveolae diffuses to the capillaries surrounding the alveolae and carbon dioxide inside the blood diffuses to the alveolae. As a result, blood is oxygenated which is then carried to the heart's left half -to the left atrium via pulmonary veins. Oxygen rich blood is prepared for the whole organs and tissues of the body. This is important because mitochondria inside the cells should use oxygen to produce energy from the organic compounds. The systemic circuit supplies oxygenated blood to the organ system. Oxygenated blood from the lungs is returned to the left atrium, then the ventricle contracts and pumps blood into the aorta. Systemic arteries split from the aorta and direct blood into the capillaries. Cells consume the oxygen and nutrients and add carbon dioxide, wastes, enzymes and hormones. The veins drain the deoxygenated blood from the capillaries and return the blood to the right atrium. The aorta is the largest of the arteries in the systemic circuit. The blood is pumped from the left ventricle into the aorta and from there it branches to all parts of the body. The aorta is an elastic artery, and as such is able to distend. When the left ventricle contracts to force blood into the aorta, the aorta expands. This stretching gives the potential energy that will help maintain blood pressure during diastole, as during this time the aorta contracts passively. The superior vena cava (SVC) is a large but short vein that carries de-oxygenated blood from the upper half of the body to the heart's right atrium. It is formed by the left and right brachiocephalic veins (also referred to as the innominate veins) which receive blood from the upper limbs and the head and neck. The azygous vein (which receives blood from the ribcage) joins it just before it enters the right atrium. The inferior vena cava (or IVC) is a large vein that carries de-oxygenated blood from the lower half of the body into the heart. It is formed by the left and right common iliac veins and transports blood to the right atrium of the heart. It is posterior to the abdominal cavity, and runs along side of the vertebral column on its right side. Heart showing the Coronary Arteries The coronary circulation consists of the blood vessels that supply blood to, and remove blood from, the heart muscle itself. Although blood fills the chambers of the heart, the muscle tissue of the heart, or myocardium, is so thick that it requires coronary blood vessels to deliver blood deep into the myocardium. The vessels that supply blood high in oxygen to the myocardium are known as coronary arteries. The vessels that remove the deoxygenated blood from the heart muscle are known as cardiac veins. The coronary arteries that run on the surface of the heart are called epicardial coronary arteries. These arteries, when healthy, are capable of auto regulation to maintain coronary blood flow at levels appropriate to the needs of the heart muscle. These relatively narrow vessels are commonly affected by atherosclerosis and can become blocked, causing angina or a heart attack. The coronary arteries are classified as "end circulation", since they represent the only source of blood supply to the myocardium: there is very little redundant blood supply, which is why blockage of these vessels can be so critical. In general there are two main coronary arteries, the left and right. •	Right coronary artery •	Left coronary artery Both of these arteries originate from the beginning (root) of the aorta, immediately above the aortic valve. As discussed below, the left coronary artery originates from the left aortic sinus, while the right coronary artery originates from the right aortic sinus. Four percent of people have a third, the posterior coronary artery. In rare cases, a patient will have one coronary artery that runs around the root of the aorta. In human anatomy, the hepatic veins are the blood vessels that drain de-oxygenated blood from the liver and blood cleaned by the liver (from the stomach, pancreas, small intestine and colon) into the inferior vena cava. They arise from the substance of the liver, more specifically the central vein of the liver lobule. They can be differentiated into two groups, the upper group and lower group. The upper group of three typically arises from the posterior aspect of the liver and drain the quadrate lobe and left lobe. The lower group rise from the right lobe and caudate lobe, are variable in number, and are typically smaller than those in the upper group. None of the hepatic veins have valves. Cardiac cycle is the term used to describe the relaxation and contraction that occur, as a heart works to pump blood through the body. Heart rate is a term used to describe the frequency of the cardiac cycle. It is considered one of the four vital signs. Usually it is calculated as the number of contractions (heart beats) of the heart in one minute and expressed as "beats per minute" (bpm). When resting, the adult human heart beats at about 70 bpm (males) and 75 bpm (females), but this rate varies between people. However, the reference range is nominally between 60 bpm (if less termed bradycardia) and 100 bpm (if greater, termed tachycardia). Resting heart rates can be significantly lower in athletes, and significantly higher in the obese. The body can increase the heart rate in response to a wide variety of conditions in order to increase the cardiac output (the amount of blood ejected by the heart per unit time). Exercise, environmental stressors or psychological stress can cause the heart rate to increase above the resting rate. The pulse is the most straightforward way of measuring the heart rate, but it can be deceptive when some strokes do not lead to much cardiac output. In these cases (as happens in some arrhythmias), the heart rate may be considerably higher than the pulse. Every single 'beat' of the heart involves three major stages: atrial systole, ventricular systole and complete cardiac diastole. Throughout the cardiac cycle, the blood pressure increases and decreases. As ventricles contract the pressure rise, causing the AV valves to slam shut. The heart in the systole phase. The heart in the systole phase. Systole, or contraction, of the heart is initiated by the electrical cells of the sinoatrial node, which is the heart's natural pacemaker. These cells are activated spontaneously by depolarization of their membranes beyond a certain threshold for excitation. At this point, voltage-gated calcium channels on the cell membrane open and allow calcium ions to pass through, into the main, or interior, of the muscle cell. Some calcium ions bind to receptors on the sarcoplasmic reticulum causing an influx of calcium ions into the sarcoplasm. The calcium ions bind to the troponin, causing a conformation change, breaking the bond between the protein tropomyosin, to which the troponin is attached, and the myosin binding sites. This allows the myosin heads to bind to the myosin binding sites on the actin protein filament and contraction results as the myosin heads draw the actin filaments along, are bound by ATP, causing them to release the actin, and return to their original position, breaking down the ATP into ADP and a phosphate group. The action potential spreads via the passage of sodium ions through the gap junctions that connect the sarcoplasm of adjacent myocardial cells. Norepinephrine (noradrenaline) is released by the terminal boutons of depolarized sympathetic fibers, at the sinoatrial and atrioventricular nodes. Norepinephrine diffuses across the synaptic cleft binds to the β1-adrenoreceptors – G-protein linked receptors, consisting of seven transmembrane domains – shifting their equilibrium towards the active state. The receptor changes its conformation and mechanically activates the G-protein which is released. The G-protein is involved in the production of adenosine 3',5'-cyclic monophosphate (cAMP) from adenosine triphosphate (ATP) and this in turn activates the protein kinase (β-adrenoreceptor kinase). β-adrenoreceptor kinase phosphorylates the calcium ion channels in the sarcolemma, so that calcium ion influx is increased when they are activated by the appropriate transmembrane voltage. This will of course, cause more of the calcium receptors in the sarcoplasmic reticulum to be activated, creating a larger flow of calcium ions into the sarcoplasm. More troponin will be bound and more myosin binding sites cleared [of tropomyosin] so that more myosin heads can be recruited for the contraction and a greater force and speed of contraction results. [Phosphodiesterase catalyses the decomposition of cAMP to AMP so that it is no longer able to activate the protein kinase. AMP will of course, go on to be phosphorylated to ATP and may be recycled.] Noradrenaline also affects the atrioventricular node, reducing the delay before continuing conduction of the action potential via the bundle of HIS. The heart in the diastole phase. The first heart tone, or S1, "Lub" is caused by the closure of the atrioventricular valves, mitral and tricuspid, at the beginning of ventricular contraction, or systole. When the pressure in the ventricles rises above the pressure in the atria, these valves close to prevent regurgitation of blood from the ventricles into the atria. The second heart tone, or S2 (A2 and P2), "Dub" is caused by the closure of the aortic valve and pulmonic valve at the end of ventricular systole. As the left ventricle empties, its pressure falls below the pressure in the aorta, and the aortic valve closes. Similarly, as the pressure in the right ventricle falls below the pressure in the pulmonary artery, the pulmonic valve closes. During inspiration, negative intrathoracic pressure causes increased blood return into the right side of the heart. The increased blood volume in the right ventricle causes the pulmonic valve to stay open longer during ventricular systole. This causes an increased delay in the P2 component of S2. During expiration, the positive intrathoracic pressure causes decreased blood return to the right side of the heart. The reduced volume in the right ventricle allows the pulmonic valve to close earlier at the end of ventricular systole, causing P2 to occur earlier, and "closer" to A2. It is physiological to hear the splitting of the second heart tone by younger people and during inspiration. During expiration normally the interval between the two components shortens and the tone becomes merged. The heart contains two cardiac pacemakers that spontaneously cause the heart to beat. These can be controlled by the autonomic nervous system and circulating adrenaline. If the cardiac muscles just contracted and relaxed randomly at a natural rhythm the cycle would become disordered and the heart would become unable to carry on its function of being a pump. Sometimes when the heart undergoes great damage to one part of the cardiac muscle or the person incurs an electric shock, the cardiac cycle can become uncoordinated and chaotic. Some parts of the heart will contract whilst others will relax so that instead of contracting and relaxing as a whole, the heart will flutter abnormally. This is called fibrillation and can be fatal if not treated within 60 seconds. The atrioventricular node (abbreviated AV node) is the tissue between the atria and the ventricles of the heart, which conducts the normal electrical impulse from the atria to the ventricles. 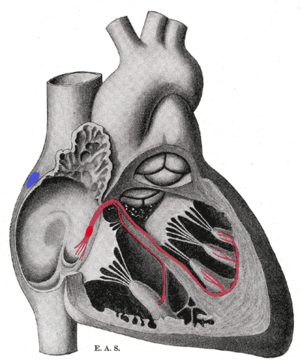 The AV node receives two inputs from the atria: posteriorly via the crista terminalis, and anteriorly via the interatrial septum. An important property that is unique to the AV node is decremental conduction. This is the property of the AV node that prevents rapid conduction to the ventricle in cases of rapid atrial rhythms, such as atrial fibrillation or atrial flutter. The atrioventricular node delays impulses for 0.1 second before spreading to the ventricle walls. The reason it is so important to delay the cardiac impulse is to ensure that the atria are empty completely before the ventricles contract (Campbell et al., 2002). The blood supply of the AV node is from a branch of the right coronary artery in 85% to 90% of individuals, and from a branch of the left circumflex artery in 10% to 15% of individuals. In certain types of supraventricular tachycardia, a person could have two AV Nodes; this will cause a loop in electrical current and uncontrollably-rapid heart beat. When this electricity catches up with itself, it will dissipate and return to normal heart-beat speed. The bundle of HIS is a collection of heart muscle cells specialized for electrical conduction that transmits the electrical impulses from the AV node (located between the atria and the ventricles) to the point of the apex of the fascicular branches. The fascicular branches then lead to the Purkinje fibers which innervate the ventricles, causing the cardiac muscle of the ventricles to contract at a paced interval. These specialized muscle fibers in the heart were named after the Swiss cardiologist Wilhelm His, Jr., who discovered them in 1893. Cardiac muscle is very specialized, as it is the only type of muscle that has an internal rhythm; i.e., it is myogenic which means that it can naturally contract and relax without receiving electrical impulses from nerves. When a cell of cardiac muscle is placed next to another, they will beat in unison. The fibers of the Bundle of HIS allow electrical conduction to occur more easily and quickly than typical cardiac muscle. They are an important part of the electrical conduction system of the heart as they transmit the impulse from the AV node (the ventricular pacemaker) to the rest of the heart. The bundle of HIS branches into the three bundle branches: the right left anterior and left posterior bundle branches that run along the intraventricular septum. The bundles give rise to thin filaments known as Purkinje fibers. These fibers distribute the impulse to the ventricular muscle. Together, the bundle branches and purkinje network comprise the ventricular conduction system. It takes about 0.03-0.04s for the impulse to travel from the bundle of HIS to the ventricular muscle. It is extremely important for these nodes to exist as they ensure the correct control and co-ordination of the heart and cardiac cycle and make sure all the contractions remain within the correct sequence and in sync. Purkinje fibers (or Purkyne tissue) are located in the inner ventricular walls of the heart, just beneath the endocardium. These fibers are specialized myocardial fibers that conduct an electrical stimulus or impulse that enables the heart to contract in a coordinated fashion. Purkinje fibers work with the sinoatrial node (SA node) and the atrioventricular node (AV node) to control the heart rate. During the ventricular contraction portion of the cardiac cycle, the Purkinje fibers carry the contraction impulse from the left and right bundle branches to the myocardium of the ventricles. This causes the muscle tissue of the ventricles to contract and force blood out of the heart — either to the pulmonary circulation (from the right ventricle) or to the systemic circulation (from the left ventricle). They were discovered in 1839 by Jan Evangelista Purkinje, who gave them his name. The contractions of the heart are controlled by electrical impulses, these fire at a rate which controls the beat of the heart. The cells that create these rhythmical impulses are called pacemaker cells, and they directly control the heart rate. Artificial devices also called pacemakers can be used after damage to the body's intrinsic conduction system to produce these impulses synthetically. Fibrillation is when the heart flutters abnormally. This can be detected by an electrocardiogram which measures the waves of excitation passing through the heart and plotting a graph of potential difference (voltage) against time. If the heart and cardiac cycle is functioning properly the electrocardiogram shows a regular, repeating pattern. However if there is fibrillation there will be no apparent pattern, either in the much more common 'Atrial Fibrillation', or the less likely but much more dangerous 'Ventricular Fibrillation'. In a hospital during VF the monitor would make a sound and alert the doctors to treat the fibrillation by passing a huge current through the chest wall and shocking the heart out of its fibrillation. This causes the cardiac muscle to stop completely for 5 seconds and when it begins to beat again the cardiac cycle would have resumed to normal and the heart will be beating in a controlled manner again. Fibrillation is an example of "circus movement" of impulses through the heart muscle. Circus movement occurs when an impulse begins in one part of the heart muscle and spreads in a circuitous pathway through the heart then returns to the originally excited muscle and "re-enters" it to stimulate it once more. The signal never stops. A cause of circus movement is long length pathway in which the muscle is no longer in a refractory state when the stimulus returns to it. A "flutter" is a circus movement in coordinated, low frequency waves that cause rapid heart rate. If the Bundle of HIS is blocked, it will result in dissociation between the activity of the atria and that of the ventricles, otherwise called a third degree heart block. The other cause of a third degree block would be a block of the right, left anterior, and left posterior bundle branches. A third degree block is very serious medical condition that will most likely require an artificial pacemaker. E.C.G stands for Electrocardiogram and represents the electrophysiology of the heart. 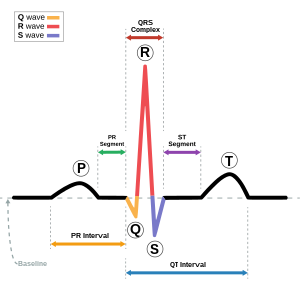 Cardiac electrophysiology is the science of the mechanisms, functions, and performance of the electrical activities of specific regions of the heart. The ECG is the recording of the heart's electrical activity as a graph. The graph can show the heart's rate and rhythm, it can detect enlargement of the heart, decreased blood flow, or the presence of current or past heart attacks. ECG's are inexpensive, Non-invasive, quick, and painless. Depending on the results, the patient’s medical history, and a physical exam; further tests or a combination of medications and lifestyle changes may be ordered. P wave- indicates that the atria are electrically stimulated (depolarized) to pump blood into the ventricles. QRS complex- indicates that the ventricles are electrically stimulated (depolarized) to pump blood out. ST segment- indicates the amount of time from the end of the contraction of the ventricles to the beginning of the T wave. T wave- indicates the recovery period (repolarization) of the ventricles. After an action potential excites the plasma membrane of the cardiac muscle cell the contraction is due to an increase in the cytoplasmic concentration of Calcium ions. Similar to skeletal muscle, the release of Ca+ ions from the sarcoplasmic reticulum binds to troponin which allows actin to bind with myosin. The difference between skeletal muscle and cardiac muscle is that when the action potential opens voltage gated calcium ion channels in the T-tubules. The increase in cytosolic calcium causes calcium ions to bind to receptors on the surface of the sarcoplasmic reticulum. The binding of calcium ions to these receptors causes the opening of more calcium ion channels in the SR membrane. Calcium ions then rush out of the SR and bind to troponin and allow the myosin and actin to bind together which causes contraction. This sequence is called calcium-induced calcium release. Contraction ends when the level of cytosolic calcium returns to normal resting levels. Blood pressure is the pressure exerted by the blood on the walls of the blood vessels. Unless indicated otherwise, blood pressure refers to systemic arterial blood pressure, i.e., the pressure in the large arteries delivering blood to body parts other than the lungs, such as the brachial artery (in the arm). The pressure of the blood in other vessels is lower than the arterial pressure. Blood pressure values are universally stated in millimeters of mercury (mmHg). The systolic pressure is defined as the peak pressure in the arteries during the cardiac cycle; the diastolic pressure is the lowest pressure (at the resting phase of the cardiac cycle). The mean arterial pressure and pulse pressure are other important quantities. Typical values for a resting, healthy adult are approximately 120 mmHg systolic and 80mm Hg diastolic (written as 120/80 mmHg), with individual variations. These measures of blood pressure are not static, but undergo natural variations from one heartbeat to another, and throughout the day (in a circadian rhythm); they also change in response to stress, nutritional factors, drugs, or disease. Systolic Pressure is the highest when the blood is being pumped out of the left ventricle into the aorta during ventricular systole. The average high during systole is 120 mmHg. Diastolic blood pressure lowers steadily to an average low of 80 mmHg during ventricular diastole. Cardiovascular disease refers to the class of diseases that involve the heart and/or blood vessels (arteries and veins). While the term technically refers to any disease that affects the cardiovascular system, it is usually used to refer to those related to atherosclerosis (arterial disease). These conditions have similar causes, mechanisms, and treatments. Over 50 million Americans have cardiovascular problems, and most other Western countries face high and increasing rates of cardiovascular disease. It is the number 1 cause of death and disability in the United States and most European countries. By the time that heart problems are detected, the underlying cause (atherosclerosis) is usually quite advanced, having progressed for decades. There is therefore increased emphasis on preventing atherosclerosis by modifying risk factors, such as healthy eating, exercise and avoidance of smoking. Atherosclerosis is a disease affecting the arterial blood vessel. It is commonly referred to as a "hardening" or "furring" of the arteries. It is caused by the formation of multiple plaques within the arteries. Arteriosclerosis ("hardening of the artery") results from a deposition of tough, rigid collagen inside the vessel wall and around the atheroma. This increases the stiffness, decreases the elasticity of the artery wall. Atherosclerosis typically begins in early adolescence, is usually found in most major arteries, and yet is asymptomatic and not detected by most diagnostic methods during life. It most commonly becomes seriously symptomatic when interfering with the coronary circulation supplying the heart or cerebral circulation supplying the brain, and is considered the most important underlying cause of strokes, heart attacks, various heart diseases including congestive heart failure and most cardiovascular diseases in general. Plaque Atheroma or commonly known as plaque is an abnormal inflammatory accumulation of macrophage white blood cells within the walls of arteries. Circulatory Shock is a severe condition that results from reduced blood circulation. A thrombus, or blood clot, is the final product of the blood coagulation step in hemostasis. It is achieved via the aggregation of platelets that form a platelet plug, and the activation of the humoral coagulation system (i.e. clotting factors). A thrombus is physiologic in cases of injury, but pathologic in case of thrombosis. Preventing blood clots reduces the risk of stroke, heart attack and pulmonary embolism. Heparin and warfarin are often used to inhibit the formation and growth of existing blood clots, thereby allowing the body to shrink and dissolve the blood clots through normal methods. An embolism occurs when an object (the embolus) migrates from one part of the body (through circulation) and causes a blockage (occlusion) of a blood vessel in another part of the body. Blood clots form the most common embolic material by far: other possible embolic materials include fat globules (a fat embolism), air bubbles (an air embolism), septic emboli (containing pus and bacteria), or amniotic fluid. A stroke, also known as cerebrovascular accident (CVA), is an acute neurological injury whereby the blood supply to a part of the brain is interrupted. Strokes can be classified into two major categories: ischemic and hemorrhagic. ~80% of strokes are due to ischemia. Hemorrhagic Stroke: A hemorrhagic stroke, or cerebral hemorrhage, is a form of stroke that occurs when a blood vessel in the brain ruptures or bleeds. Like ischemic strokes, hemorrhagic strokes interrupt the brain's blood supply because the bleeding vessel can no longer carry the blood to its target tissue. In addition, blood irritates brain tissue, disrupting the delicate chemical balance, and, if the bleeding continues, it can cause increased intracranial pressure which physically impinges on brain tissue and restricts blood flow into the brain. In this respect, hemorrhagic strokes are more dangerous than their more common counterpart, ischemic strokes. There are two types of hemorrhagic stroke: intracerebral hemorrhage, and subarachnoid hemorrhage. The term "brain attack" is starting to come into use in the United States for stroke, just as the term "heart attack" is used for myocardial infarction, where a cutoff of blood causes necrosis to the tissue of the heart. Many hospitals have "brain attack" teams within their neurology departments specifically for swift treatment of stroke. If symptoms of stroke are detected at early on-set, special "clot busting" drugs may be administered. These clot busters will dissolve clots before they can cause tissue death and restore normal circulation. One of the initial drugs used to dissolve clots was streptokinase, although its use creates a possibility of clot destruction throughout the entire body, leading to serious hemorrhage. There are newer, third generation thrombolytics that are safer. Angina Pectoris is chest pain due to ischemia (a lack of blood and hence oxygen supply) of the heart muscle, generally due to obstruction or spasm of the coronary arteries (the heart's blood vessels). Coronary artery bypass surgery, coronary artery bypass graft surgery and heart bypass are surgical procedures performed on patients with coronary artery disease for the relief of angina and possible improved heart muscle function. Veins or arteries from elsewhere in the patient's body are grafted from the aorta to the coronary arteries, bypassing coronary artery narrowing caused by atherosclerosis and improves the blood supply to the myocardium (heart muscle). Congestive heart failure (CHF), also called congestive cardiac failure (CCF) or just heart failure, is a condition that can result from any structural or functional cardiac disorder that impairs the ability of the heart to fill with or pump a sufficient amount of blood throughout the body. It is not to be confused with "cessation of heartbeat", which is known as asystole, or with cardiac arrest, which is the cessation of normal cardiac function in the face of heart disease. Because not all patients have volume overload at the time of initial or subsequent evaluation, the term "heart failure" is preferred over the older term "congestive heart failure". Congestive heart failure is often undiagnosed due to a lack of a universally agreed definition and difficulties in diagnosis, particularly when the condition is considered "mild". Right sided heart failure commonly causes peripheral edema, or swelling of the extremities. Left sided heart failure commonly causes pulmonary edema, or fluid buildup in the lungs. An aneurysm (or aneurism) is a localized dilation or ballooning of a blood vessel by more than 50% of the diameter of the vessel and can lead to instant death at anytime. Aneurysms most commonly occur in arteries at the base of the brain (the circle of Willis) and in the aorta (the main artery coming out of the heart) - this is an aortic aneurysm. This bulge in a blood vessel, much like a bulge on an over-inflated inner tube, can lead to death at anytime. The larger an aneurysm becomes, the more likely it is to burst. Aneurysms are also described according to their shape: Saccular or fusiform. A saccular aneurysm resembles a small sack; a fusiform aneurysm is shaped like a spindle. To dissolve blood clots you would use a drug that converts plasminogen (molecule found in blood), to plasmin, (enzyme that dissolves blood clots). One way to unblock a coronary artery (or other blood vessel) is percutaneous transluminal coronary angioplasty (PTCA), which was first performed in 1977. A wire is passed from the femoral artery in the leg or the radial artery in the arm up to the diseased coronary artery, to beyond the area of the coronary artery that is being worked upon. Over this wire, a balloon catheter is passed into the segment that is to be opened up. The end of the catheter contains a small folded balloon. When the balloon is hydraulically inflated, it compresses the atheromatous plaque and stretches the artery wall to expand. At the same time, if an expandable wire mesh tube (stent) was on the balloon, then the stent will be implanted (left behind) to support the new stretched open position of the artery from the inside. Varicose veins are veins on the leg which are large, twisted, and ropelike, and can cause pain, swelling, or itching. They are an extreme form of telangiectasia, or spider veins. Varicose veins result due to insufficiency of the valves in the communicating veins. These are veins which link the superficial and deep veins of the lower limb. Normally, blood flows from the superficial to the deep veins, facilitating return of blood to the heart. However, when the valve becomes defective, blood is forced into the superficial veins by the action of the muscle pump (which normally aids return of blood to the heart by compressing the deep veins). People who have varicose veins are more at risk of getting a Deep Vein Thrombosis (DVT) and pulmonary embolisms. Phlebitis is an inflammation of a vein, usually in the legs. This is usually the most serious if found in a deep vein. However, most people with the condition, perhaps 80 to 90 percent, are women. The disease may also have a genetic component, as it is known to run in families. Heart defects present at birth are called congenital heart defects. Slightly less than 1% of all newborn infants have congenital heart disease. Eight defects are more common than all others and make up 80% of all congenital heart diseases, whereas the remaining 20% consist of many independently infrequent conditions or combinations of several defects. Acyanotic heart defects are those in which there is a normal amount of oxygen in the bloodstream. The most common congenital heart defect is a ventral septal defect, which occurs in about 20% of all children with congenital heart disease. In VSD blood from the left ventricle is shunted to the right ventricle, resulting in oxygenated blood returning into pulmonic circulation. One of the potential problems of VSD is pulmonary hypertension. Cyanotic heart defects refer to defects that result in decreased amounts of oxygen in the blood. In cyanotic heart defects deoxygenated blood from the right ventricle flows into the systemic circulation. Cyanotic defects include tetrogy of Fallot and transposition of the great arteries. Homeostasis in the body is only possible if the cardiovascular system is working properly. This means that the system needs to deliver oxygen and nutrients to the tissue fluid that surrounds the cells and also take away the metabolic waste. The heart is composed of arteries that take blood from the heart, and vessels that return blood to the heart. Blood is pumped by the heart into two circuits: the pulmonary and systemic circuits. The pulmonary circuit carries blood through the lungs where gas exchange occurs and the systemic system transports blood to all parts of the body where exchange with tissue fluid takes place. The cardiovascular system works together with all other systems to maintain homeostasis. The lymphatic system is closely related to the cardiovascular system. There are three main ways that they work together to maintain homeostasis: the lymphatic system receives the excess tissue fluid and returns it to the bloodstream, lacteal take fat molecules from the intestinal villi and transport them to the bloodstream and both systems work together to defend the body against disease.The lymphatic system can create white blood cells that fight off disease and infections. •	Heart Disease is the number one killer in American women. •	16.7 million deaths are result forms of cardiovascular disease, heart disease and stroke. •	Stress, eating high fat foods, obesity, tobacco and alcohol use are just some risk factors of developing heart disease. •	Recent research suggests that taking a small dose of aspirin daily may help prevent a heart attack (because aspirin inhibits platelet clumping). •	The length of all your blood vessels lined up is about 60,000 miles long! To put this in perspective, the Earth's circumference is 40,075.02 kilometres and 60,000 miles is around 96,000 km - so your blood vessels would go twice around the world and still have some to spare! •	Eating healthy, good nutrition. •	Having a healthy lifestyle; don't drink, smoke, or do drugs. •	Lowering LDL cholesterol and high blood pressure. •	Reduce the fat, sodium, and calories in your diet. The heart muscle becomes less efficient with age, and there is a decrease in both maximum cardiac output and heart rate, although resting levels may be more than adequate. The health of the myocardium depends on its blood supply, and with age there is greater likelihood that atherosclerosis will narrow the coronary arteries. Atherosclerosis is the deposition of cholesterol on and in the walls of the arteries, which decreases blood flow and forms rough surfaces that may cause intravascular clot formation High blood pressure (hypertension) causes the left ventricle to work harder. It may enlarge and outgrow its blood supply, thus becoming weaker. A weak ventricle is not an efficient pump, and may progress to congestive heart failure. This process may be slow or rapid. The heart valves may become thickened by fibrosis, leading to heart murmurs and less efficient pumping. Arrhythmias are also more common with age, as the cells of the conduction pathway become less efficient. Physiological stress can be any kind of injury from burns, to broken bones; the body's response to stress is categorized in two phases the ebb phase (early phase) begins immediately after the injury. And the second phase is about 36 to 48 hours after injury is called the flow phase. In the ebb (shock) phase there is Inadequate circulation, decreased insulin level, decreased oxygen consumption, hypothermia (low body temperature), hypovolemia (low blood volume), and hypotension (low blood pressure). In the flow phase there is increased levels of catecholamine, glucocorticoids, and glucagons, normal or elevated insulin levels, catabolic (breakdown), hyperglycemic (high blood sugar), increased oxygen consumption/respiratory rate, hyperthermia (high body temperature) fever sets in, hypermetabolism, increased insulin resistance, increased cardiac output. Excitation occurs through the SA node to the AV node if there are abnormalities or drug interference that malfunctions the AV node the ventricles will not receive the initiating stimuli and the autorhythmic cells in the bundle branches begin to initiate actions on their own rate becoming the pacemakers for the ventricles. This in turn will cause conduction disorder. With conduction that causes problems with the bundle branches there is the right and the left premature ventricular contractions. Right is most common and may go untreated. Left is always a serious problem and must be treated. Animation of a normal ECG wave. •	QRS is the ventricular depolarization, as well as atrial repolarization. An example of the ever expanding technology for the heart is best described in this story: In 1955, when I was five years old, I first learned by my family physician that I had a heart murmur and that it would eventually need attention. By the time I was 15 in 1965, I had two cardiac catherizations at Rhode Island Hospital. The tests were inconclusive and I was told to go on with my life and wait and see if I had a problem. It wasn't until 1975 that I was told by my family physician that I should have my heart checked again. Dr. David Kitzes of Mariam Hospital performed another catherization. This time, unlike the others, I was told that because of new machine technology, Dr. Kitzes found that I had aortic stenosis, which is a narrowing of the valve passage by build-up of plaque due to the valve being malformed at birth. Dr. Kitzes informed me that I could lead a normal life until I was in my fifties or sixties before I would need corrective surgery. In 1996, I had an echocardiogram and it was determined that my heart was enlarged. My family physician said that I should see a cardiologist. I down played the visit as not being serious after hearing the same thing many times. This time I entered the office of Jon Lambrecht, I had never met him before. Within a few minutes my whole life was turned around. After asking me about my symptoms, which were fatigue, weakness, asthmatic symptoms, as well as ashen skin color and dizziness, he informed me of how serious my condition was and the only salvation was immediate open-heart surgery to replace the aortic valve. I began to cry as I thought my life was over. Dr. Lambrecht studied my reaction and told me that this condition is repairable and that I don't have a terminal illness. I didn't have a lot of time to think about it. Within 10 days from that visit, I was the recipient of a Meditronic Hall Prosthetic heart valve. The operation was performed by Dr. Robert Indeglia at Miriam Hospital in Providence, R.I. on March 20th, 1996. It has been almost 3 years since the surgery and I am doing better than I could have expected. In 1977 my son Kevin was born with Hypoplastic Left-heart Syndrome and only lived for 2 days because heart surgery wasn't performed like today. I am thankful that I lived at a time when medical technology paved the way for a second chance because of my new aortic heart valve. Our goal in this chapter is to take you by the hand and lead you through each part of the cardiovascular system, so that you too may learn and come to respect the greatness of this blood pumping machine we all call the heart. Cerebrovascular disease are those that affect blood vessels in the brain and happen to be the third cause of death in the United States only behind heart disease and cancer. Stroke (also called cerebrovascular accident or CVR) is a cerebrovascular disorder caused by a sudden decrease or stoppage of blood flow to a part of the brain. Decreased blood flow also known as ischemia is dangerous to any tissue but brain tissue is even more vulnerable, mainly due to the high rate of its metabolic reactions. In fact if you stopped blood flow for no more than three minutes it may be sufficient enough to cause death of most brain cells. For this reason a stroke can kill people within minutes or leave them with severe brain damage. Strokes may be classified as either occlusive or hemorrhagic and may happen either in the interior of the brain or on its surface. In a occlusive stroke blood flow through a vessel is blocked. In a hemorrhagic stroke a blood vessel ruptures causing a hemorrhage. As with all of the body systems, the cardiovascular system plays a part in maintaining homeostasis. The nervous system regulates the functioning of the heart based on what the heart is supposed to do. The pumping of the heart maintains normal blood pressure and proper oxygenation of tissues. The vascular system forms passageways for the blood, but they aren't simply just a pipeline system. The vessels are not passive tubes, but rather active contributors to homeostasis. The arteries and veins help maintain blood pressure, and the capillaries provide sites for the necessary exchanges of materials between the blood and the tissues. Antidiuretic hormone: Produced in the posterior pituitary ADH (vasopressin), major function is to regulate blood pressure by water retention by the kidneys. Atrial natriuretic peptide: Produced in the atria of the heart, it increases urinary excretion of sodium which causes water loss which in turn the viscosity of the blood is lowered and in turn lowers the blood pressure. Cerebral Vascular Accident (CVA): Also known as a stroke, is a rapidly developing loss of a part of brain function or loss of consciousness due to an interruption in the blood supply to all or part of the brain. That is, a stroke involves the sudden loss of neuronal function due to a disturbance in cerebral perfusion. There are many different causes for the interruption of blood supply, and different parts of the brain can be affected. Because of this, a stroke can be quite heterogeneous. Patients with the same cause of stroke can have widely differing handicaps. Similarly, patients with the same clinical handicap can in fact have different causes of their stroke. Epinephrine: Produced in the adrenal medulla of the adrenal glands, major function is vasoconstriction that will in turn increase respiratory rate and increase cardiac out put. Myocardium: the muscular tissue of the heart. Norepinephrine: Produced in the adrenal medulla of the adrenal glands, major function is a strong vasoconstrictor that will in turn increase respiratory rate. Van De Graaff, Kent M. Human Anatomy. McGraw Hill Publishing, Burr Ridge, IL. 2002. Tortora, G. & Grabowski, S. (2000) Principles of Anatomy & Physiology. Wiley & Sons. Brisbane, Singapore & Chichester. Anderson, RM. The Gross Physiology of the Cardiovascular System (1993) <http://cardiac-output.info>. ↑ Tortora, G. & Grabowski, S. (2000)Principles of anatomy and physiology. Ninth Edition. Wiley page 733.